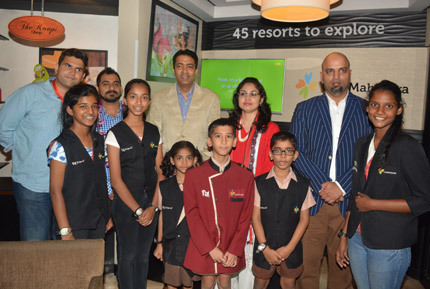 This partnership will give children a complete new learning experience of working in a holiday resort and acquire skills required for the service sector. Children can don multiple set of roles that a Club Mahindra member is likely to come in touch with at one of the resorts such as a Bell Boy, a Front Desk Executive, a Steward & a Housekeeper. The kids grasp the essence by working behind the scenes at the resort. The role-plays allow the kids to experience and learn key nuances such as teamwork, collaboration, motor-skills, socialization, customer services, gratitude, respect and responsibility. Mahindra Holidays & Resorts India Limited (MHRIL), India’s leading player in the leisure hospitality industry, offers quality family holidays primarily through vacation ownership memberships. While Club Mahindra is the flagship brand, the other brands offered by the company are – Club Mahindra Fundays and Svaastha Spa. As on December 31, 2015, MHRIL has ~194K vacation ownership members and operates 45 resorts across India and abroad. KidZania Mumbai is built like a city spread across 75,000 sq. ft. where children can independently explore and choose to role-play from 100+ exciting careers like pilot, surgeon, RJ, chef, fire-fighter among many more. KidZania emulates the workings of a city complete with a functioning economy and its own currency. Each experience is designed to empower kids, giving them the confidence to be their best selves, and inspiration to be great global citizens. The franchise license for KidZania in India is owned by Imagination Edutainment India Pvt. Ltd. whose share-holders are Singapore-based KidZ Inc, Comcraft Group, Xander Group, Maxfield Management Limited, owning 74 per cent of the franchise while actor Mr. Shah Rukh Khan owns the remaining 26 per cent in his personal capacity. Together, the group has invested Rs. 84 crores in the Mumbai facility.